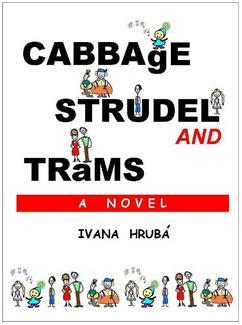 Cabbage, Strudel & Trams is a story of a young girl’s turbulent journey from childhood to adulthood, of adolescence begun behind the Iron Curtain, continued in a West German refugee camp and coming to a glorious end in the land Down Under. Narrated by Franta, an ancient wise wizard inhabiting the inner world of our young heroine Vendula, this satirical coming-of-age story depicts the trials and tribulations of an ordinary Czech family living in a small mining town in communist Czechoslovakia in the early 1980s, their escape to West Germany and their resettlement in Australia. What grabs me, keeps me reading, in Cabbage, Strudel, and Trams is the use of language (follow the link to read an excerpt and see some of the illustrations I mention further down). It’s the language, the descriptions, the play with words, and that Ivana Hrubá not only tells a story in a unique way, but also has fun with what could otherwise be a morose tale in the reading. If someone else told this tale, of course it would be different, but so many people would tell it in a straight matter of fact way or in a pain wrenching way. Hrubá still shares difficult times, doesn’t make less of them, but she makes them lighter to read. After I finished it I took a moment to let the story set in, to absorb it, and I really feel her writing style is the winning factor. I found the story entertaining and humorous, the characters uniquely portrayed and fleshed out enough to be planted in one’s memory, and just enough depth in description of surroundings to paint a picture. The last was not what I was expecting because in stories like this you expect more detail of what is going on around that person or perhaps background into the places they are from or pass through, but in reality Cabbage, Strudel, and Trams is not about those places, but about the person and the people around her. I think the only real downfall for me, and this may be attributable to a pet peeve, is the use of other languages without explanation. There were a lot of times where it just made sense what the translation would be anyway, given the context (it did help that I recognise German in written form), but there were times when I would be distracted from the story because I was trying to figure out what the word was. In the end, even though it was enough for me to notice, it was really only a small thing and in a way played up to Hrubá’s playfulness. I also really enjoyed the use of narration with the story not being told via first person in the sense of Vendula (the person we are following), but instead in Franta who appears to be an imaginary friend. I don’t always believe Franta is an imaginary friend though, I think Franta might be just that voice in your head when you question things. And to top it all off; the illustrations. There’s illustrations all through the book to show and emphasis the characters and the story itself. Some of them are quite comical, setting off the wonderful sense of humour, and some are just plain cute. Even my Mum made a comment on them when she caught a glimpse of one when I was reading. I think Cabbage, Strudel, and Trams is something I’d recommend to those who have an interest in biography, Communist communities, and what it’s like to immigrate to a new culture, but only if those people appreciate a sense of humour and don’t want something that dwells on the downside. Instead it’s for the people who want to read about someone’s story (because this is based on someone’s actual life), but see upsides to certain situations and colourful characters. Thank You To: Ivana Hrubá who was so kind as to give me a copy to read.